Also known as assigned seating, reserved seating allows your patron to select their seat using a seating chart. 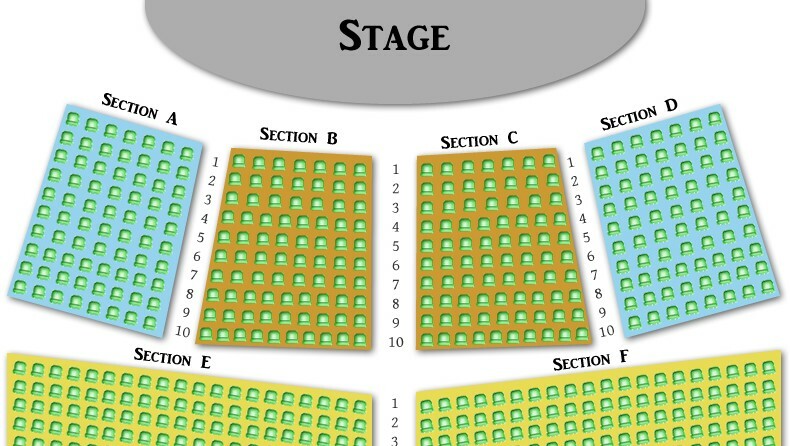 The seating chart (or seating diagram) is representative of the actual venue and shows the patron where each seat is in respect to the stage. The diagram will also show each section of the venue, likely indicated by color and clearly labeled. It is important that your seating chart is as accurate as possible, so your patrons are not disappointed when they arrive at the performance. EZ Ticketing allows you to arrange seating any way you want, with the seats able to face in any direction so you can have a realistic as possible representation of your venue. EZ Ticketing allows you to set prices based on section, seat, date and ticket type. You can apply prices to entire sections or to individual seats, set specific pricing on certain days, and vary the types of tickets for a given seat (e.g. Adult and Child tickets). It is very flexible and will accommodate almost any configuration. In some cases, it is necessary to have more than one view of the seating chart. For example, if the venue has a balcony it is preferable to have a main level diagram and a balcony diagram. EZ Ticketing allows for multiple views so your customers can select the area they want to sit in first, then select their actual seat.